What’s so special about ginger? Rooted in tradition, steeped with goodness. Ginger is unlike anything else in the culinary world. Its flavour is both earthy and bright, hot and sweet. Ginger is a root, and like all roots, it absorbs nutrients from the soil. It’s used in every form imaginable: dried, powdered, juiced, fresh, or as an oil. The health benefits are tremendous, such as pain relief, as a stomach aide, aromatherapy, or possibly even an anti-cancer agent! Ginger originated in China, and was well known for it’s medicinal purposes. It is referenced in a medical text from 2000 BCE, and is still included in 50% of all traditional herbal remedies. It’s potent flavour and medicinal attributes made it a valuable export, where it was shipped across the spice trade. Soon ginger flooded Asia, India, the Mediterranean, and the tropics. India is currently the largest producer of ginger, where the region uses ginger prominently in it’s cooking. 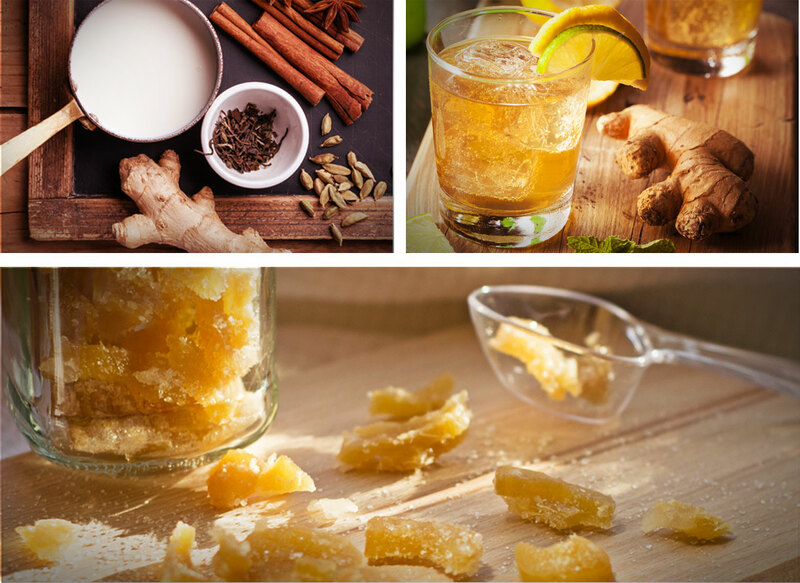 The most exquisite thing about ginger is it’s amazing flavour, used around the world in a variety of ways. Japan pickles their ginger, China loves theirs candied and dusted with sugar. Jamaica brews theirs into beer, while the UK creates wine. The Philippines steep theirs into ginger tea, but India boils theirs with a host of other spices and milk to make masala chai. Most of North America would recognize gingerbread, ginger snaps and other baked goods, while Vietnam harnesses the savoury elements of ginger by adding the leaves to soup. Step up your drinks without crossing the line.